The past four years have been marked with the release of My Little Pony: Equestria Girls feature length movies. 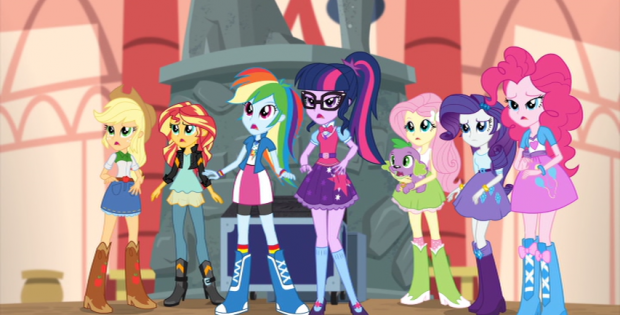 The films allowed the pony characters to turn into high school aged humans in an alternate universe. But this year, there’s been a slight change. Instead of one movie, My Little Pony: Equestria Girls: Magical Movie Night is three separate adventures involving the characters. “Dance Magic” has the girls team up with a rival school to create a dance video for a contest. However with rivals joining, there’s a bit of friction to their moves. “Movie Magic” has the friends invite to a movie set where something goes wrong during the shoot. “Mirror Magic” has Starlight Glimmer crossover from Equestria to Canterlot High. Will she want to return after experiencing the joy of having hands instead of hooves? The movie was run as a miniseries on Discovery Family earlier in the summer. But they work fine in a movie format without having to put up with all opening and closing credits of three episodes. Josie wasn’t bothered that this wasn’t one narrative such as the previous four movies. Just make sure you have plenty of popcorn for your kids before hitting play. The video is 1.78:1 anamorphic. The transfers bring out the detail in the animation. The audio is 5.1 Dolby Digital Surround. The music numbers sound great in the speaker system. The movie is subtitled. Shout! Factory presents Wakefield. Directed by: Ishi Rudell & Katrina Hadley. Screenplay by: Noelle Benvenuti. Starring: Tara Strong, Ashleigh Ball, Andrea Libman. Running Time: 65 minutes. Released: August 8, 2017.